I have had some issues with the DJI Phantom 3 Pro dropping the video feed to the ‘monitor’ ie, my phone. It is very very very very very very very very disconcerting when it drops as all the data goes with it (things like battery voltage, flight time remaining and so on). Sure, you just look up and keep flying from where it is, but eh, it sure would be nice if it hung about a bit more than both a few minutes and a few feet. Did some reading and everyone agrees, the bulk of the issue is Android. DJI just have not given the Android version of the app as much love as iOS. I could not justify or afford to buy a dedicated iOS device just to fly, so after talking to Freddy, she agreed to let me use her iPad whenever I needed. (It’s not like I make a living from flying and so don’t fly that often, and usually its when I drive, and she is usually still asleep at those times). We did some test flights and sure enough, the app itself was more stable, it did not crash, but the video did break up in the usual digital green distortion. Back to the Internet, seems the antennas DJI use are, shall we say, less than optimal. So, I jumped on Amazon and made my selection. 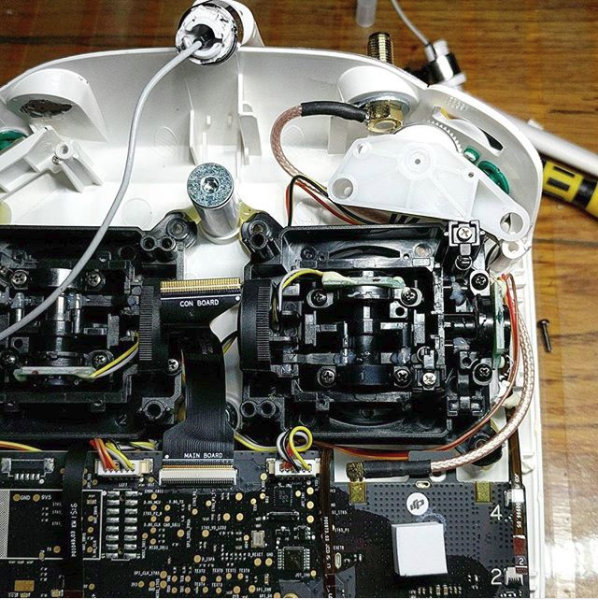 The DJI ones are hard wired in, so the upgrade consists of two parts, pulling out the original and replacing the coax cable with a lower loss version and a threaded mount to screw new/different antennas on. 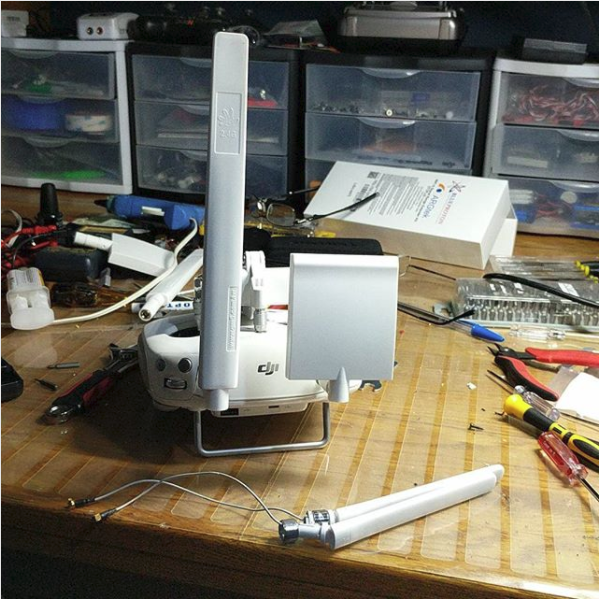 It was a bit of tight fit, and we had to pad a few washers around the antenna mount point as the previous drone owner had damaged the case around the antenna base when he closed the case lid on them at some stage. But, bottom line, I was able to get the new mount in nice and firm and gripping onto enough of the case to be solid. The nice thing about having a standard mount (RPA) is that I can run a few different antenna types. Here we have a tall omni directional and a small square patch directional antenna. The patch will have more gain, distance, but requires that I turn and always point the remote at the drone. Depending on the flight requirements, this may or may not be a big deal. Honestly, I suspect that most of the time, I will run the tall rabbit ears. Of course I did a few before and after test flights. Before the drone would get to about 100 feet and the video would break up. After, with the long omni’s, I went to my legal limit of 400 feet and the video feed was rock solid. So, I’m going to call that a win and stop messing with the tech and just fly more. Long story to this one, but I only have the last part, so will just tell you about that part of it. While in Australia, we got talking about drones with Gary and Dan. Drones are more Gary’s thing, but Dan is happy to go along for the ride, regardless, when the three of us get to tell stories about our drone days, it’s never a dull time…. When I heard the story about a drone taking a chunk out of Gary’s dining table, my attention was peaked…. Where was said drone? It was in the corner of bad drone shame…. Had been sitting there for some time. Gary was not sure it was safe to let out. Stupid or smart, he gifted it to me with stern warnings about its unruly behaviour and generally bad table manners. Figuring it was up for a full rebuild, I just hastily stripped it and stuffed it in my luggage for the trip home. (Sorry, no photo for some sad reason). Finally got some time on it just before Terry came home for Spring break. The plan was to prep it for Terrys arrival. He is a whiz at programming the transmitter we use (I wisely purchased the exact same model transmitter for this exact reason), I am better on the drone side of things (for now, he is catching up). Will do another blog on how to get Windows 10 to talk to the flight controller on the drone, but enough to say, glad I started a few days before Terry arrived. Updated the firmware on the drone and was ready for the boy. We only had evenings together after work – when I am never at my worn out best – but came home and checked his work on the programming, agreed it looked the business and so put some propellers on and took it out into the back yard. I could be wrong, but this first flight seems to match the bad table manners flight description pretty closely. Back to the drone room. Re-checked and re-calibrated the flight controller after tweaking a few settings. We also re-calibrated the electronic speed controllers. There are 4, one on each motor and they need to know (and all agree) both 0% and 100% throttle range from the transmitter and flight controller. It’s a stretch to call it actually flying… but eh, we will take anything we can get at this stage…. In other words, any flight that does not break propellers is a good one? Two issues. Firstly, the test pilot is still getting his head around how the DJI flight controller manages throttle. Terry’s drones take stick down to be ‘zero’, this drone thinks ‘zero’ at 50% stick. He’s getting his head around this while test flying an unknown and uncontrollable drone, happy to cut him some slack. The second issue is that some controls are reversed, but we don’t know that for sure just yet. Got our (ok, @thebaldgeek's) 9" #rescuequad in the air, finally!! Pretty smooth once we figured things out .. especially the channel inversions for both yaw and roll..(?) Maiden part 5 and two sets of props. The fact that it flew into the garden turned out to be helpful. It tipped us off to the fact that two of the controls were reversed. We are also getting our heads around the different flight modes that the drone has pre-programmed (GPS, Alti and Manual). We are also slowly memorizing the LED flash codes before and during flight. This is helpful because it is the only window into the status of the flight controller. (DJI Naza-M v1). We did not film it, but after this flight, I put a pack through in the back yard. Loved it. 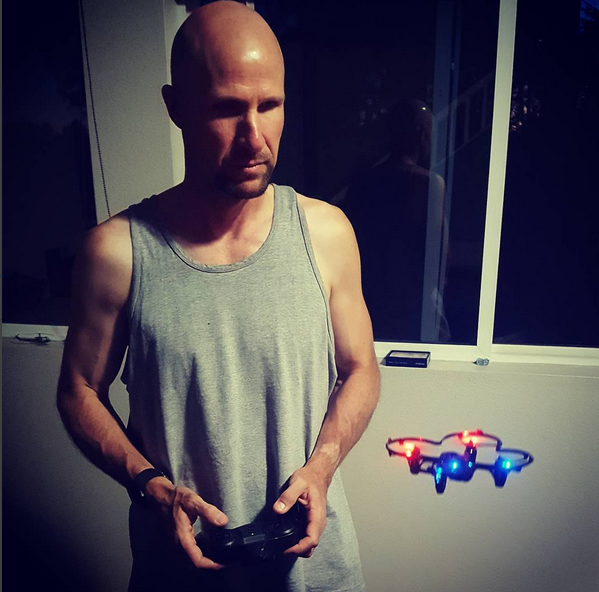 Super twitchy, very powerful and fast drone, but we got the little sucker sorted and that’s the main thing. So, Thanks Gary. Sorry you are out a drone, but your Phantom 4 is more your thing, so I don’t feel too bad for taking this one off your hands. Terry and I had a great time working on it together and we look forward to flying it more often now that summer is on the way. Can’t believe that it’s only been 3 and a bit weeks since I got back from the most epic Australian adventure ever. Have / having had a little bit of trouble getting my head around being back home, but nothing major. Throwing myself into some tech and that has helped a lot. The first week or so consisted of a fair bit of movie watching (I plead jet lag and just wanting to crash after work), but the past week has seen almost no TV and tinkering each night. Using the Opto 22 Raspberry Pi starter kit for this one…. That and (as you can see at the end of the video), a tiny bit of Node-RED. Bought the boss’s old Phantom 3 Pro drone. Been taking it for my Sunday morning Smart Car drives and slowing getting confidence in flying it and getting better at taking landscape photos with it. 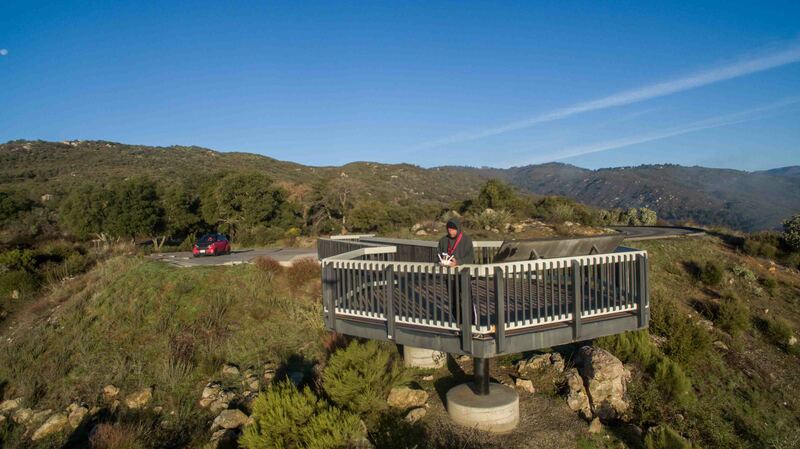 Of course, you can’t fly a drone and not take a dronie…. Still planning on getting around to committing to study for, sit and pass my Part 107. (aka, drone license). So, I guess you could say I am back, but don’t feel back. Not sure what to do with the blog. Same as last time I suspect, write about what interests me and you lot can sort it out on your end. Events have conspired to push us back into flying radio control aircraft. Specifically, drones, multirotor or quadcopters… They all the same thing, but people call them different names. Here is a quick recap of how this all came about. We shoot video case studies at work to highlight how companies use our gear to automate a process. It’s good for them and it’s good for us, it helps their future customers understand how that company can help them, and it helps our future customers hear and see how others have used our gear. So, a few weeks back, we had a case study video shoot to do in Northern California, cold storage of fruit. 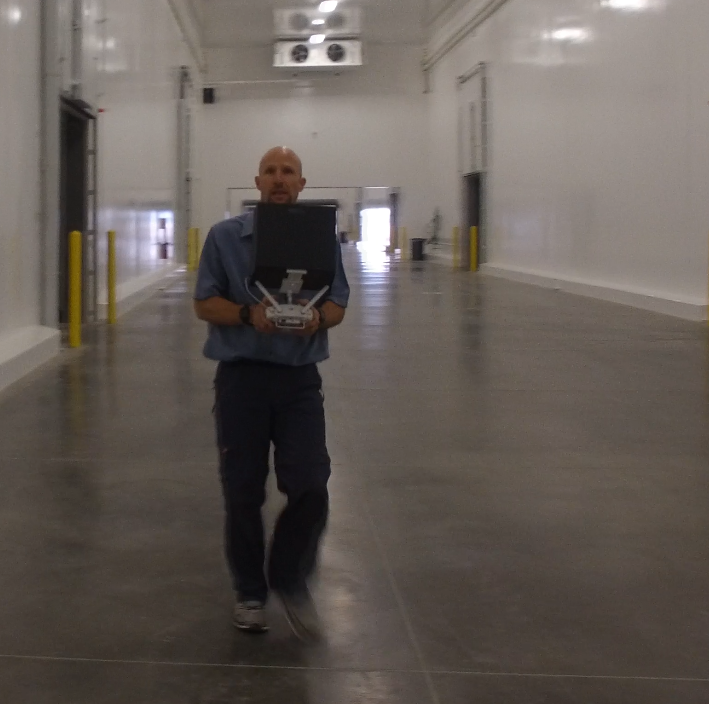 At first, the boss said that he would be flying the drone… It is after all, HIS drone. He has flown it a few times and he also doubles as the director for the film crew, so it makes sense for him to be there. Events built to the point where he was not going to be able to make it, so that left me to pick up the drone (I also do camera B and audio duties). Long story short, I had around 3 days to learn how to set it up and fly it. 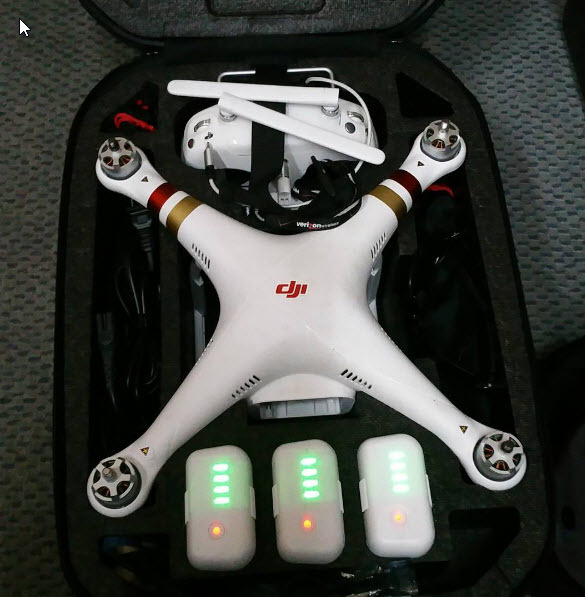 The DJI Phantom 3 Professional is no longer their top of the line drone, but it is still a lot of drone. Costing something north of 1500 bucks, it is also out of my price range. The really interesting thing for me is that flying the thing is as much about the software as it is about flying. 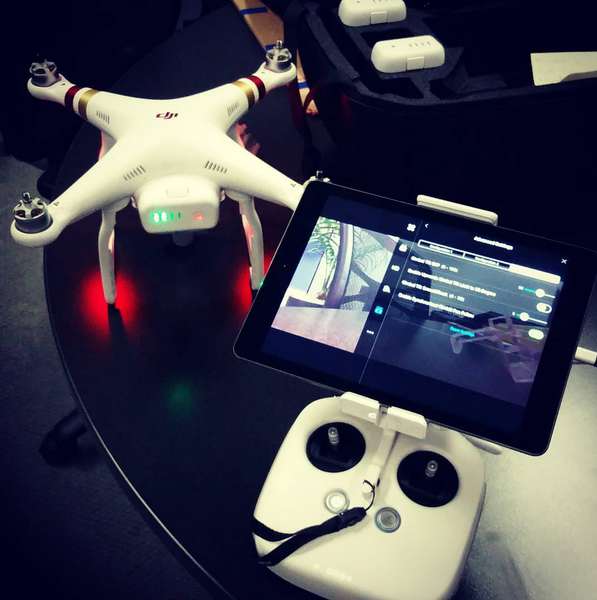 The system uses a tablet, in this case an iPad something (Sorry, I don’t know anything about Apple products – it just works with the drone is all I know), it gets the feed from the remote. Both video and data show up. Both are required to fly the drone. I was not going to learn how to fly on the job, so we did a few quick flights the Sunday before we left. Rusty, but the drone has GPS, altitude lock and active stabilization electronics to help. The thing that really weirds me out is that you pretty much fly it from the video feed 99% of the time. Only during takeoff and landing do I look it (and even then I’m sure there are guys that do the whole thing from the video feed). This is very different to how I have flown fix wing stuff in the past! 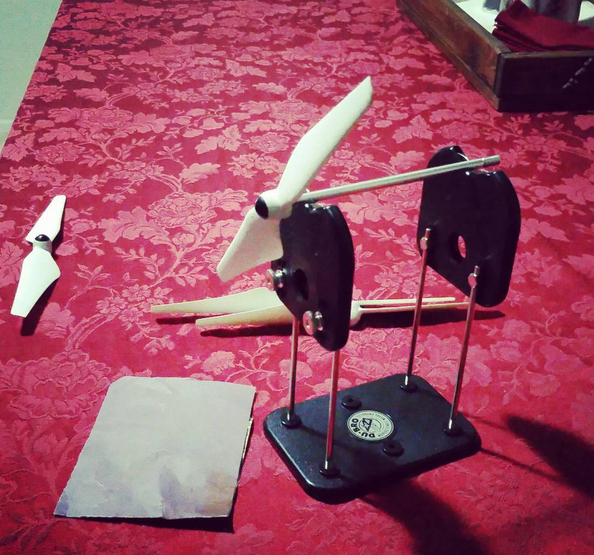 We also had to brush up on old skills like propeller balancing. To say I was nervous is a MASSIVE understatement. If we get some time, I plan to rough edit some of the video shots we got and share them here. Here is a photo that our video guy got of me, I had no idea that he took this photo. Here is one that I took of me from the drone. At this point, I am flying inside the massive cool room that they store grapes in. The good news is two fold. Firstly, I did not crash. Secondly, I get to do more flying latter this week at another video case study. In the middle of the two weeks Freddy and Terry asked me what I wanted for a Father’s day present (apparently I am hard to buy presents for… and my name is not even Gary…). The answer was pretty simple…. I needed a small practice drone. I am flying for work and pleasure. Right now the FAA are between rules, so we are looking at whats required to keep this up moving forward. At the moment it is still the bosses drone. Not sure whats going to happen there as he has been using it less and less (that was happening long before this shoot – just to be clear). It’s the sort of thing that if you don’t keep it up, you get rusty…. As I can attest to. 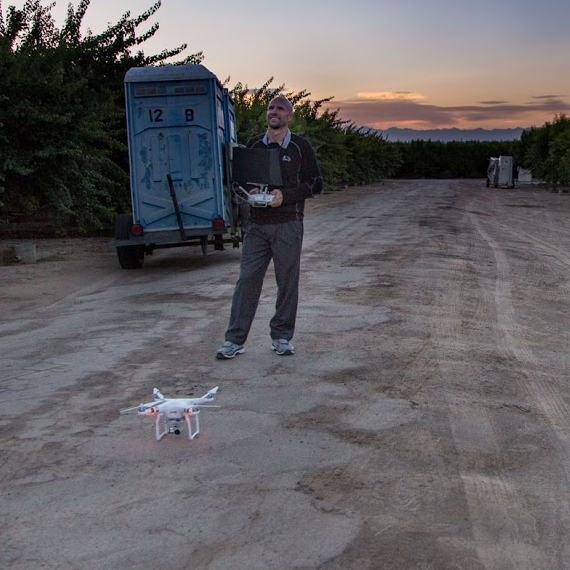 You might read or hear more about drones moving forward. Radio control aircraft seem to be making a comeback into my life. Amazing how stuff like this works out.